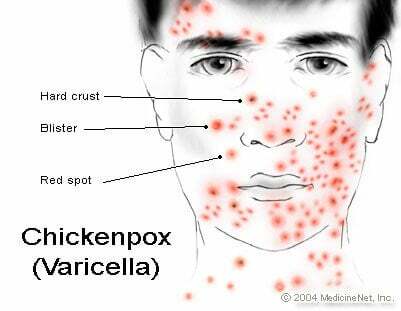 Chickenpox: A highly infectious viral disease also known medically as varicella -- in many countries, this disease is always called "varicella" -- that causes a blister-like rash, itching, fatigue and fever. The rash crops up first on the face and trunk and can spread over the entire body resulting in 250 to 500 itchy blisters. Chickenpox is highly infectious. The virus spreads from person to person by direct contact or through the air by coughing or sneezing. It takes from 10-21 days after contact with an infected person for someone to develop chickenpox. People with chickenpox are contagious a day or two before the rash appears and until all blisters have formed scabs. In children, chickenpox most commonly causes an illness that lasts about 5-10 days. Children usually miss 5 or 6 days of school or childcare due to their chickenpox. Their symptoms may include high fever, severe itching, an uncomfortable rash, dehydration, and headache. About 1 child in 10 has a complication from chickenpox -- infected skin lesions, other infections, dehydration from vomiting or diarrhea, exacerbation (worsening) of asthma and pneumonia -- that is serious enough to warrant a visit to the doctor. Certain people are especially likely to have a serious illness from chickenpox. These at-risk groups include infants, adolescents, and adults and people with weak immune systems from either illnesses or from medications such long-term steroids or chemotherapy. Chickenpox has nothing at all to do with chicken. The name was meant to distinguish this "weak" form of the pox from smallpox. "Chicken" is used here, as in "chickenhearted," to mean weak or timid. The "pox" of chickenpox is no major matter unless it becomes infected (through scratching) or occurs in an immunodeficient person. However, there can be very major problems from chickenpox including pneumonia and encephalitis and reactivation of the same herpes virus is responsible for shingles (zoster). Chickenpox is responsible for more deaths than measles (rubeola), mumps, whooping cough (pertussis) and H. flu (Haemophilus influenzae type B) meningitis combined. Contrary to what many people believe, chickenpox is by no means a mild disease. A healthy person can die from the disease. From 1990 to 1994, before there was a vaccine available, there were about 50 chickenpox deaths in children and 50 chickenpox deaths in adults every year in the US. Most of these persons were healthy or did not have a medical illness such as cancer that placed them at higher risk of getting severe chickenpox. Most of the healthy adults who die from chickenpox contract the disease from their unvaccinated children. The current aim in the US is to achieve universal (or come as close as possible to universal) immunization of children with the chickenpox vaccine. The rationale for childhood chickenpox vaccination is not just to protect the children but also to protect everyone with whom they come in contact, including adults (who can die from the chickenpox) and pregnant women (so that the unborn baby does not get chickenpox). Because chickenpox in children is usually not serious, some people think it is safe to let children get the disease. However, it is never possible to predict who will have a mild case of chickenpox and who will have a serious or even deadly case of disease. Now that there is a safe and effective vaccine available, it is not worth taking this risk. A person can get chickenpox more than once but it is uncommon to do so. For most people, one infection is thought to confer lifelong immunity. Who Needs a Chickenpox Vaccine?